This is an artwork by Charlot Byj. We, humans cannot be contented with what we have. We have this unending desire seek for more. We want to aim higher and higher. Well, there is nothing wrong with that. In fact, it is good that we have goals to keep pushing ourselves. And we pray to God to grant us our desires. We pray that we may be able to land at this job, to pass this test, to be like this and that, and many other more. There are times when we demand of God, "You said, 'Ask and you will receive. 'We have faith but You did not answer our prayers." That can be a factor why there are many people who do not have faith in God anymore. They were devastated with the "broken promises" of God. But it should not be the case. "You ask but do not receive, because you ask wrongly." God answers are prayers in a way that is best for us. We must not be mad at God thinking that He is not really answering our prayers. We must not turn our backs from prayers because of this. We must reflect on how we pray to God. Do we pray just for the compliance of praying? Or do we pray with our hearts open and complete surrender before the Lord? Do we pray like, "Lord, give me this, I should be like that..." or anything similar to that? Or do we pray like, "Lord, I am not worthy that I should be asking this. But if it is Your will, I will really be grateful. I ask You O Lord to please..." and other prayers like that? Let us try to recall how we prayed when we were still kids. But if it is too hard to remember, let us ask children how they pray. Maybe we can reflect on their answers. 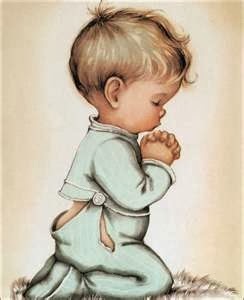 Maybe we will also be able to remember how we prayed when we were younger. Or better yet, we will remember how God answered our prayers from when we were still kids until we grew older. We must not cease in our prayer life. We continue to be humble and keep our faith as we ask for God's grace.